For years in many black political circles, there has been an ongoing discussion over the need for a firm that lobbies on behalf of black interests. As it turns out, however, the Congressional Black Caucus has been producing effective lobbyists for decades, it’s just that they’re lobbying against the interest of black people instead of in favor of those interests. The GOP isn’t shy about its antipathy to government regulations, and a pro-business coalition known as the New Democrats has come to its aid. 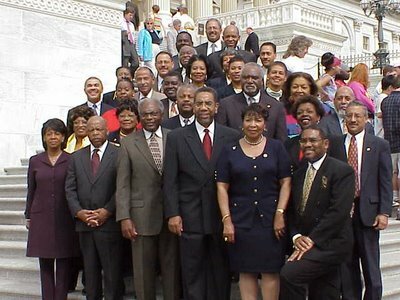 But there is also a third, lesser-known faction: the Congressional Black Caucus. Moore, along with colleagues such as New York’s Gregory Meeks, Georgia’s David Scott, Missouri’s Lacy Clay and Alabama’s Terri Sewell, has pushed for a host of seemingly arcane measures that would undermine Dodd-Frank’s rules on financial derivatives, the complex contracts at the heart of the 2008 meltdown. She is the co-sponsor of multiple measures that would once again allow Wall Street to shift its riskiest transactions out of the view of regulators. The report details how a group of former CBC staffers turned lobbyists formed an informal group called the Washington Government Relations Group. Instead of the group using its formidable political knowledge to further the interests of black people, they chose instead to use their talent and connections to lobby the CBC on behalf of Wall Street. The lobbying industry even has a term for these black lobbyists: CBC specialists. In February 2013, Moore and Fudge joined three Republicans to introduce HR 677, a bill that would allow corporate conglomerates to trade derivatives among their myriad subsidiaries without following Dodd-Frank’s trading rules. The bill infuriated financial reform watchdogs, who say it makes it much harder for regulators to see risks accumulating in the system and could facilitate international tax-dodging. Moore’s measure probably won’t ever get a vote on the House floor, but it doesn’t need to. After proposing a relatively robust rule on the topic, the Commodity Futures Trading Commission switched course last year and finalized a regulation that adheres closely to Moore’s language. Members of the CBC have also been sneekily sending letters to regulators “championing” the rights of Wall St. banks. Of course, when these same CBC members give press conferences championing social justice, they don’t mention that they themselves are already in the pockets of Wall St. That doesn’t sell well when you’re on MSNBC or the Tom Joyner Show. In another example, CBC members waged war against the Volcker rule in 2012, a rule popular among mainstream and left of center liberals that “bans banks that receive taxpayer perks from making speculative trades for their own accounts.” Meeks, Scott, Sewell, and Clay were all onboard with killing the rule. Moore, who has also been a key member in supporting the banking industry, has a chief of staff who is onboard with the financial services lobby as well as a former staffer who is in the pocket of the industry as well. Regarding financial reform, Waters has been fighting for the soul of the CBC. “It’s critically important that we understand the significance of that reform, that we send the message that we’re about protecting our taxpayers and investors, ” said Waters. Waters may be in for the fight of her life. Ms. Carnell, I’ve been critical of some of your articles in the past, but this article is excellent. Please keep us updated. Are many of you now opening up your eyes to these people? I’ve been awake for a mighty long time to their hypocrisy and self-service. Their actions have been speaking volumes just as long as many of them have been in office, but folks would rather support them anyway out of sheer, fake solidarity. Vote them out of office and hopefully we can find those who will put the needs of the people first instead of themselves, but I highly doubt it. They all might as well be Boulé members, that is, if they aren’t already. JUST think about what has happened to black AMERICA over these years a fake drug war where it’s the government itself that’s responsible for much of the dope on the streets and then the prison industry was wrapped around our heads in response to these very same drugs. AND now we’re dealing with a flood of illegal aliens and our representatives are not coming to our defense but to the people who broke the law and who cannot vote . WE’VE been fools to long my people it’s time to clean house. Seriously not surprised at all. Corporations run this government masquerading as a democracy , when it’s really Fascism. ROBERT@atx It most certainly is. If they have been in office for over 20 years and your community or district has not changed, why keep voting for them to stay in office? I’ve been saying this ever since I returned back to this country 14 years ago. Vote them out of office. They’ve racked up millions of dollars and have their benefits to live off for the rest of their lives while their constituents only have their divisive rhetoric to go on. We’ve got to wake the people from their somber and state of denial. I’M one of those people that you speak of that come from district whose representative has been there over 30 years I’M from so.central LA; and although I don’t live there now I resided in MAXINE WATERS district who is mentioned in this article. I came up during the drug wars of LA and I know that MAXINE WATERS knows that our government is responsible for most of the drugs that enter this country; she has made speeches on the subject and even testified before hearings. MY problem is that the drug business has only gotten larger since that time and she no longer speaks on the subject so there has to be some sort of complicity with her as well as the CBC because what type of people would stay silent while there very own communities are being poisoned. IF you’re not familiar with the story read the links below and see what went down in LA. Excellent article… and due credit to the HuffPo reporters who obtained the trove of correspondence upon which it’s based. “Leveraging” the hard won credibility of the historic Freedom movement on behalf of their corporate sponsors has been the standard operating procedure of large sections of our black political class for a good while now. Black politicians and fixers engineered the downfall of Detroit, the ethnic cleansing of New Orleans, and the demolition and dispersal of public housing communities across the country. Once upon a time it was easier to believe they represented us in the halls of power. Nowadays they clearly are the black faces of that power. It’s been my observation that the overwhelming majority of black voters r terribly naïve politically. Thx, Mr.Dixon, for all ur fine work at BAR, along with Glen Ford, Margaret Kimberly, Nellie Bailey, et al. It’s VERY much appreciated. Will be checking out today’s posts. Thanks for the links, but I’m quite familiar with Maxine Waters. Unfortunately, there are some who don’t think critically enough to see that they are being used for political and monetary gain. They haven’t noticed that their beloved elected officials spend most of their time catering to corporate interests instead of their interests, all the while thinking this will create jobs. Yet another black institution proving themselves to be in the pay of the corporations, whilst ostensibly a sea of black faces designed to present diversity at the political level. Unfortunately, such corruption crosses racial boundaries and is present at every facet of society. The African-American community cannot afford to be supporting people who do not care for its interests, which is why it is important to read independent black news forums to get real opinions on current events without special interests. Personally, if I were living in America, i would be forming a committee and demanding the firing of all members helping to collude with Wall Street at the expense of the American taxpayer, whether he is black or white. Their actions are precisely what sensible regulations are trying to avoid for the good of the many. If they want to help Wall Street, they can go ask for a job from JP Morgan & Chase and practice their idiocy and callousness there. Just not under the banner of the CBC. I am not sure I understand how this has any impact on the average Black. When a person buys a home they should be sure to be honest and diligent. They should not expect to purchase more property than they can afford and someone in their local community should explain to them the interest rate and gimmicks that they sign. If an individual allows a salesperson to enter numbers on a form, that they are going to sign, that are incorrect they should understand that they, not the salesperson, are responsible for the document! Every Black community should have an office that a person who does not understand contracts could go to for advice. We need to stop blaming others for our lack of knowledge! Watchful So what is a Boulé in your mind and what does it have to do with anything? Is their something wrong with them? Yeah, we SHOULD have received reparations long ago, but we all know things aren’t often as they SHOULD be. Here’s an excerpt from an article that offers what I feel is a honest analysis of the issue you’ve addressed in your comments. In my mind, they r ‘servants to the king’ who work to keep our ppl held back for the benefit of their masters and for their own personal benefit. And yes, there’s definitely something wrong with them ‘in my mind’. Hope that answer’s ur question. BTW, here’s a coupla links u can check out if u like to help u become more informed on just what the Boulé is and what its agenda is.